The FoodGuard Texas Certificate Examination consists of 75 questions with an additional 5 personal questions throughout the exam for security purposes. 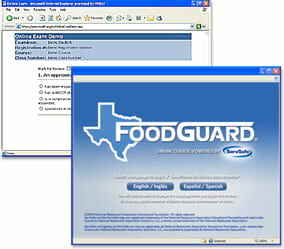 You will have 90 minutes to complete the FoodGuard Texas Certificate Examination. You must complete the test in one session. You will need to answer all of the security questions correctly in order for your test to be valid. If you do not answer a security questions correctly your test session will be suspended.